Compliment circles are one of our favorite activities and probably one of the most important things I do in my first grade classroom. 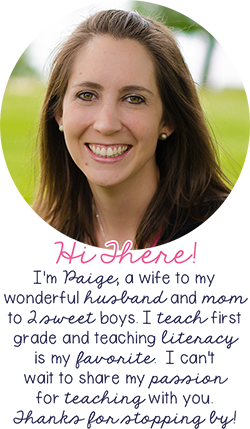 They teach my students how to give and receive compliments as well as create a classroom of respect and kindness. Keep reading to see how you can transform your classroom into a compliment giving, respectful and kind classroom. 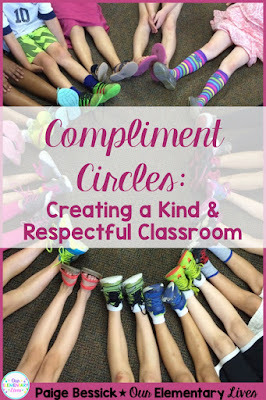 A compliment circle is something that I do in my classroom every couple of weeks. I'd love to do it weekly, and that's my goal, but you know how it can be, it just doesn't happen. So, I'm sure you're wondering what is is and how to do it. I got this idea after doing an activity similar to this at a professional development. We did something like this with colleagues and I loved it and thought how could I incorporate this into my classroom? 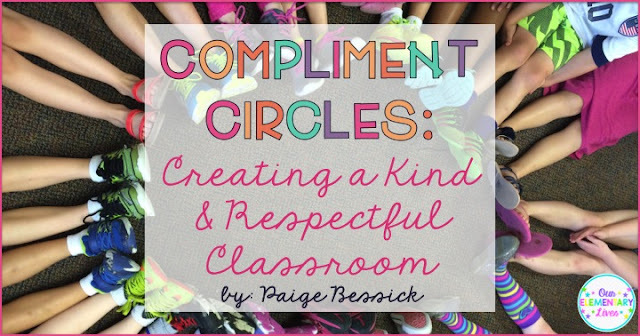 A compliment circle is an activity that teaches students how to give and receive compliments. Essentially, the idea is that in a compliment circle every student will give a compliment to one classmate and every student will receive a compliment from another classmate. To start a compliment circle, everyone, including the teacher, sits in a circle with their legs stretched out, like this picture. Once you have your circle ready, I ask for a volunteer to start. That person picks a classmate, says their name nice and loud so everyone can hear and then gives them a compliment. The friend who received the compliment says "Thank you!" and then pulls their legs up to sit criss-cross applesauce. That way the class knows who still needs to receive a compliment. You could also have students put a thumb on their knee, but that can get hard to see, so I do the legs. After that, you go around the circle, until everyone has given and received a compliment. Before I introduce the compliment circle to my class, we talk a lot about what a compliment is. I teach them that it is something nice you say about someone and that it's really important to be sincere. And yes, we have to talk about what it means to be sincere or genuine. We also talk about the rules from the beginning. Click HERE or on the image to get it for FREE! The first time we do a compliment circle, we start by complimenting each other's clothes, yes it's a little superficial, but students begin to learn what a compliment is. We use the sentence starter "I like your..." Students then fill in the sentence. "I like your blue shoes." "I like your pretty purple dress." Once students understand that a compliment is telling someone something nice about them, we move away from compliments about their clothes and move onto compliments about things they are good at. This is usually the second or third circle we do, depending on how long it takes them to get the first compliments down. This time we use the sentence starter, "You are good at..." Students say things like, "You are good at reading." "You are good at soccer." The final step, by our fourth or fifth circle, I let the students come up with compliments on their own and that's how we continue for the rest of the year. I do have the rule that is cannot be about their clothes anymore. Those compliments are too easy. I want students to really think about their classmates and come up with something they know they do well, something they saw them do that was kind, or some time when they noticed they were working really hard. Throughout the week, I give reminders that they should be looking for good things their friends are doing so they have some ideas for compliments when we do our next compliment circle. I use this mini-poster to help my students come up with compliment starters. 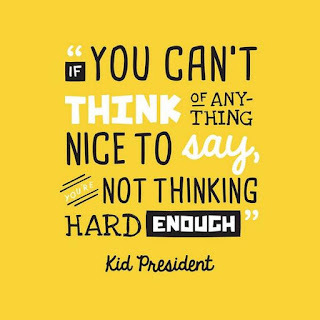 You will have the students who seem to give the same compliment as someone before them, give a compliment to the same friend every time, or just can't come up with something nice to say. To help these situations, if they come up, I will compliment students who choose new friends, give a truly sincere compliment, or make the rule that it has to be someone that isn't their best friend. I'm sure you can come up with other ideas on how to alleviate these situations when they come up, because you know they will. We talk a lot about finding nice things to say and that it's always possible to find something, you just have to think hard enough. I use this quote all the time. So that's it. Pretty easy, right? As we continue to do compliment circles, I have noticed a genuine change in my students. They start noticing the good things their classmates do and will often times give compliments not just in our circle. 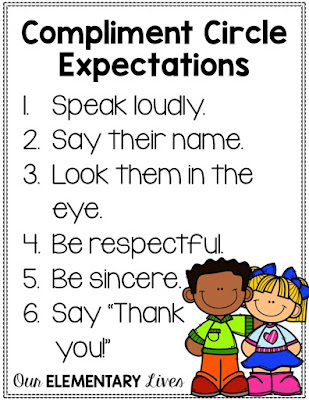 They will give compliments to their classmates as they notice them doing something nice, working hard or just following directions. It's a truly magical shift that I see in my classroom and I hope you can see that too. Let me know if you have done this or something like it. I'm always looking for ways to encourage my students to be kind, so please share them in the comments. 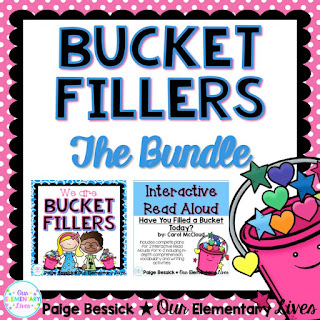 If you're looking for other activities to teach your students how to be kind and respectful check out this resource! Click HERE or on the image to be taken to this resource. If this is something you think others will like, please pin and share! Until next time, Stay Positive & Be Kind. I love compliment circles, and the fact that your students are starting so young will only benefit them later in life! I do this as well and I write them down so the kids can take them home. That's such a great idea! Thanks for sharing and stopping by. I used to have a "child of the week" (everybody got a turn). They stood on a chair in the middle of the circle and everybody around the circle said something that likes about the person or they were good at. I wrote then down with fancy pens. I copied the sheer so the child could take it home, and put the original in a special book in the book corner. If they were having a bad day or falling out with friends I'd encourage them to go to the book corner and see how values that were or look at the good points people noticed about their friend. Must start doing something like this again - my current class aren't very caring to one another. Thanks for the comment. I really like the idea of writing them down and making a book. It's great for the students to hear it from their peers. Thanks for sharing! Am I missing how to get the mini poster? I tried clicking on all of the images, but no luck! Thank you! I love this and will be incorporating it into my schedule this Fall! Thanks so much Paige!